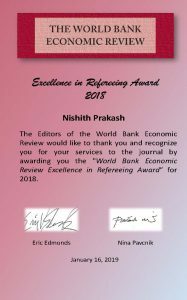 Professor Nishith Prakash has received the “World Bank Economic Review Excellence in Refereeing Award”, recognizing his service to the journal World Bank Economic Review. The mission of The World Bank Economic Review is to encourage and support research in the field of development economics. We seek to publish and disseminate innovative theoretical and empirical research that identifies, analyzes, measures, and evaluates the macro and micro-economic forces that promote or impede economic development with a view towards providing the knowledge necessary for designing, implementing, and sustaining effective development policies in low and middle income countries. Our intended audience comprises a worldwide readership of economists and other social scientists in government, business, international agencies, universities, and research institutions. Professor Susan Randolph has received the Grawemeyer Award for Improving World Order. Professor Randolph’s work is being furthered through the Human Rights Measurement Initiative, HRMI (pronounced Her Me) – https://humanrightsmeasurement.org – targeted to human rights advocacy groups and civil society. Longtime University of Connecticut professor Susan Randolph received the prestigious Grawemeyer Award for Improving World Order, which honors those who take on issues of global concern and present ideas that inspire others and can lead to a more just and peaceful world. 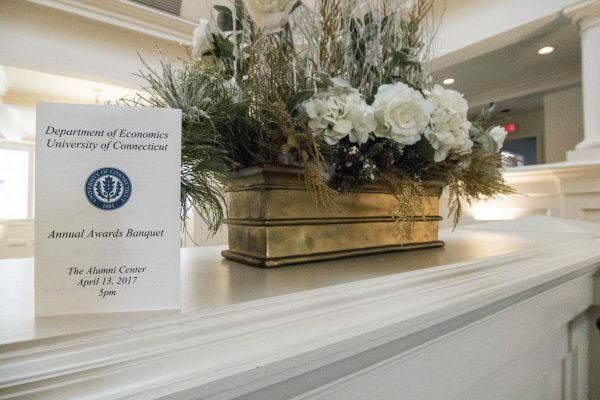 Randolph, the Gladstein Committee Member and Professor Emeritus in Economics, was jointly recognized for the 2019 award from the University of Louisville along with collaborators and book co-authors Sakiko Fukuda-Parr, of The New School in New York City, and Terra Lawson-Remer, Stanford University. The three were named co-winners for the ideas set forth in their book, Fulfilling Social and Economic Rights. The work, published in 2015 by Oxford University Press, offers a method for gauging how well nations are providing basic human rights of food, health, education, housing, work and social well-being to their citizens and suggests how they can advance such rights even further. The trio used the United Nations’ 1948 Universal Declaration of Human Rights and 1966 International Covenant on Economic, Cultural and Social Rights as a basis for their work, creating a new tool, the Social and Economic Rights Fulfillment (SERF) Index, to measure nations’ progress toward human rights goals. Their book also sheds light on policies that advance human rights and explains how use of these policies and public pressure can lead to results. “Scholars working across disciplines have used the SERF to forge new tools for shaping policy and scholarship, driving more inclusive and dynamic approaches to economic development,” said Shareen Hertel, co-director of UConn’s Research Program on Economic and Social Rights. Although the authors noted there has been steady progress in social and economic rights fulfillment over the past 30 years, they found that disparities still exist in every region of the world. Their measurement tool is aimed at helping governments and other organizations address those disparities. In 2016, the book won the American Political Science Association’s Human Rights Section Best Book Award. Previous winners of the Grawemeyer Award for Improving World Order include Mikhail Gorbachev, honored for his 1988 address to the United Nations which led to the effective end of the Cold War and paved the way for the democratization of Eastern Europe and the Baltic republics; Trita Parsi, for his work toward reducing tensions in the Middle East; and Dana Burde, for her work examining the influence foreign-backed funding for education has on war-torn countries and how such aid affects humanitarian and peace-building efforts. Recipients of the 2019 Grawemeyer Awards are being named this week pending formal approval by university trustees. The annual, $100,000 prizes reward outstanding ideas in music, world order, psychology, education and religion. Winners visit Louisville in April to accept their awards and give free talks on their winning ideas. Economics undergraduate student Mary Vlamis and Professor Jorge Agüero have been selected to receive a 2019 Social Sciences, Humanities, and Arts Research Experience (SHARE) award. They will be working on a project exploring whether merit-based scholarships could reduce racial and gender discrimination in the labor markets of developing countries. “The SHARE program supports undergraduate research projects in the social sciences, humanities, and arts. SHARE is designed especially for students in the earlier stages of their college careers as a means of introducing students to research in their chosen field and of developing skills they will need for further research projects. 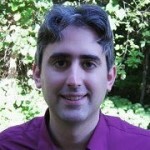 The Program on Children “focuses on economic behavior related to children, child health, and child economic and social well being.” Professor Simon’s research interests include health inequality, policy and health capital accumulation, early life and childhood human capital accumulation, and public policy evaluation. 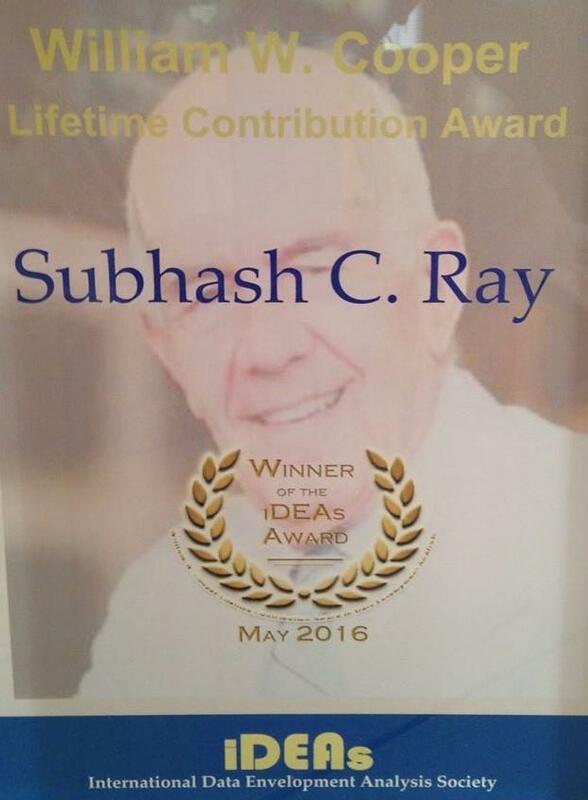 The International Data Envelopment Society (iDEAs) selected Professor Subhash Ray as this year’s winner of the William W. Cooper Lifetime Contribution Award in the field of Data Envelopment Analysis at the DEA2016 Conference recently held in Wuhan, China. Professor William Cooper and his lifelong collaborator Abraham Charnes, along with their graduate student Eduardo Rhodes, developed Data Envelopment Analysis (DEA) in 1978 as a nonparametric method of measuring efficiency that is especially useful for evaluating performance of non-profit organizations and government departments through benchmarking. In 1979, while still a PhD student, Professor Ray started working on DEA and applied the newly developed method in a UNDP project to measure efficiency of primary health care centers in Costa Rica and Guatemala. 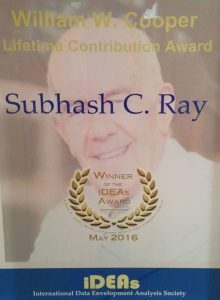 Over the past decades Professor Ray’s methodological and empirical contributions to the DEA literature have been published in leading Economics and Operations Research/Management Science journals including American Economic Review and Management Science. His book Data Envelopment Analysis: Theory and Techniques for Economics and Operations Research published by Cambridge University Press in 2004 still continues to be a popular reference book for researchers in the field. He is a Senior Editor of The DEA Journal. The Provost’s office at the University of Connecticut regularly recognizes faculty members with excellent teaching evaluations commending them as achieving “excellence in teaching”. 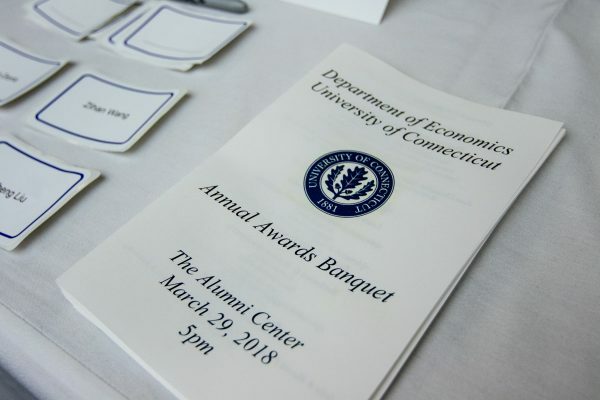 A number of faculty members in the economics department have received this recognition in the past year: Professors Talia Bar, Ken Couch, Delia Furtado, Paul Hallwood, Olivier Morand, Susan Randolph, Kathy Segerson, Mikhael Shor, Owen Svalestad, and Jackie Zhao. Congratulations to these economics faculty for their important contributions to the educational mission of UConn!